It’s a fact. Slow-cooked, juicy, fall-off-the-bone ribs make our mouths water. Here’s an easy recipe that you can prep a few days ahead, give a quick char on the grill and off you go. Wet-naps not included. 2 Full slabs of Baby Back or St. Louis Style Pork Ribs, cut into four half slabs. Combine BBQ Sauce Ingredients in saucepan and simmer for 15 minutes over medium heat. Stir regularly to avoid scorching of the tomato ketchup. Cool completely. Coat ribs with BBQ Dry Rub thoroughly. Brush off excess. Place ribs under a broiler or on the grill to brown. About 10 minutes. Cool completely before vacuum sealing. Set the Sous Vide Professional™ to 140°F/60°C, with the rear port closed and front port fully open. With The Smoking Gun™ and a sealed container, smoke cooled BBQ sauce with Whiskey Barrel smoke for five minutes. Add enough smoke to trap in container. Let sit for five minutes. Remove lid, stir to incorporate. Repeat, if more smoke flavor is desired. 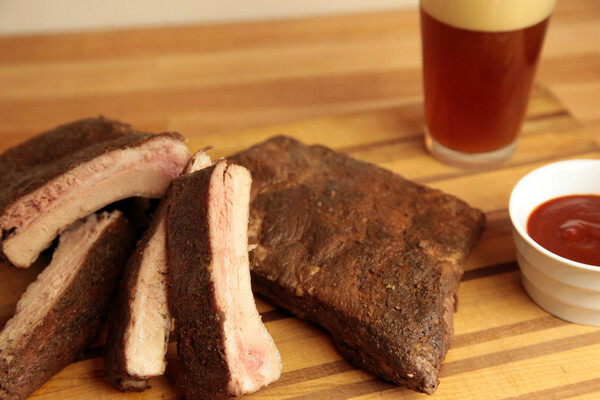 Brush sauce on slabs of ribs to coat top-side thoroughly. Reserve sauce for next steps. Vacuum seal ribs with an additional two tablespoons of sauce in the bag. Reserve remaining sauce in refrigerator for final step. Place sealed bag in circulating water bath and cook for 48 hours. Remove bag, carefully open the pouch. Brush remaining sauce on ribs. Optional: Place ribs under broiler or on grill to caramelize.